I'm lucky! Here's the kicker: I'm not even Irish! Coming back to our point, that feeling of being jinxed when one is about to put 500-1000 rds downrange is not the most confidence inspiring. Being the lucky SOB that I am, my second lucky break was that I was getting ready to head out to the Harvey, IL police range to take Team Spartan's "Advanced Pistol 2" class with John Krupa and Vince Jamison. See, Krupa and Jamison are consumate instructors that'll ensure you do everything safe, but push you to your limits so that that you won't make a mistake on the street! Furthering my lucky streak, the weather kept partly couldy (nice to mimize sun) and we didn't get delluged or vortex-ed like last time! Ok... So enough about me yapping about my good luck, what is AP2 about? 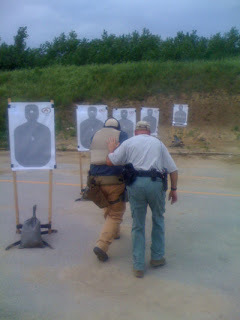 AP2 builds on a lot of the techniques that were presented in AP1 - the natural shooting stance, thumbs forward grip, etc - but focuses on deploying the pistol as an offensive weapon that is used to engage an active shooter. This is not without its own controversy: 1.) A pistol as an offensive weapon(?) and 2.) the idea that offensive tactics that are, well, potentially "offensive" to the sheep. In exploring the justifications to those two issues, we'll see more of what AP2 is all about. First off, keep in mind that Krupa and Jamison are Chicago Police and that until the recent decision to equip some officers with M4's, the rank-and-file didn't have access to rifles. If faced with an active shooter scenario, the operator is going to use what is available to them at the time: the pistol. This meshes with the reality of active shooter incidents in the real world - Say Uncle explores some of those situations in his article "Mass murderers vs. Armed Citizens". While the pistol is usually understood to be defensive in nature, especially so for its civilian role, it can make for an effective offensive weapon: it's small size in close quarters where a rifle wouldn't be effective and the fact that most folks train more with their pistols than any other platform. The pistol is most effective at short range, so getting into range is paramount: AP2 had us doing a lot of footwork! Examining the footwork component, in the first half of the class, Krupa had us working constantly on continous motion during stoppages, magazine changes, and "hunting scenarios" - the pistol at low-ready, eyes scanning, waiting to see a threat and challenge or asses. Most active firing was done from tanding position, firing a short string (2-3 shots). These basics culminated during a continous motion drill while firing on a swinging target (windmill-type): two cones setup ~10' apart. Starting from one cone, move off the line of force, fire 2-3 shoots and move to the next cone, fire 2-3 shots, etc. The key is to keep moving during magazine changes, while working/clearing stoppages. Oh, and don't forget that you've got to get that target to turn over and that you'll run out of ammunition at some point! After lunch, we focused on putting movement together with firing: we discussed the concepts of "warrant service speed" and "hostage resuce speed" and focused on motion forwards and backwards with the rest of the firing line while a partner ensured (by pushing or pulling) that we weren't too far forward or back. It was interesting that movement backwards was often smoother than movement forwards! 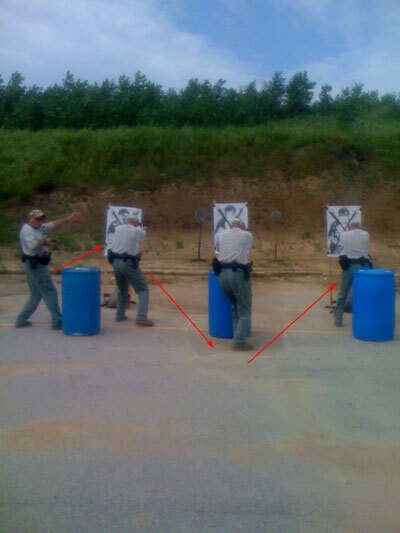 During one of our breaks, Krupa set up a series of blue barrels and we began working on lateral motion around cover while engaging multiple targets. At this point, most people were already engraining movement and felt pretty comfortable working around the barrels. At some point during this drill, the point was raised how to approach the situation if someone was working with you: enter position "SUL". SUL is a simple concept that is much talked about - it specifically points the pistol, held vertically, to the ground just before your feet. While the weapon is in SUL, it is possible to move around friendlies or other people without sweeping them with the muzzle. This rotational motion was practice and on the line under the instructors watchful eyes. Final culmination was a live-fire "snake drill" through a section of barrels with friendlies interspersed!